Also serving communities of Pleasant Prairie. There are 7 Memory Care Facilities in the Kenosha area, with 5 in Kenosha and 2 nearby. The average cost of memory care in Kenosha is $4,553 per month. This is lower than the national median of $4,650. To help you with your search, browse the 18 reviews below for memory care facilities in Kenosha. On average, consumers rate memory care in Kenosha 4.0 out of 5 stars. Better rated regions include Gurnee with an average rating of 5.0 out of 5 stars. Caring.com has helped 5 families in Kenosha find high-quality senior care. To speak with one of our Family Advisors about memory care options and costs in Kenosha, call (855) 863-8283. Situated within the dementia-friendly community of Kenosha County, the city of Kenosha offers a wide array of services and supports for seniors with dementia and their families and caregivers. Local seniors with dementia can access specialized resources like personalized music and memory programs and fun social opportunities to promote quality of life. The Alzheimer's Association estimates that about 110,000 people in Wisconsin have Alzheimer's disease, a disease that primarily targets adults age 65 and over. Kenosha's own senior community comprises about 12 percent of its population of nearly 100,000 people. To support seniors living with Alzheimer's disease and other forms of dementia, the Kenosha area has more than two dozen memory care facilities. Thirteen memory care facilities are located in Kenosha, and another 13 are located in nearby cities. 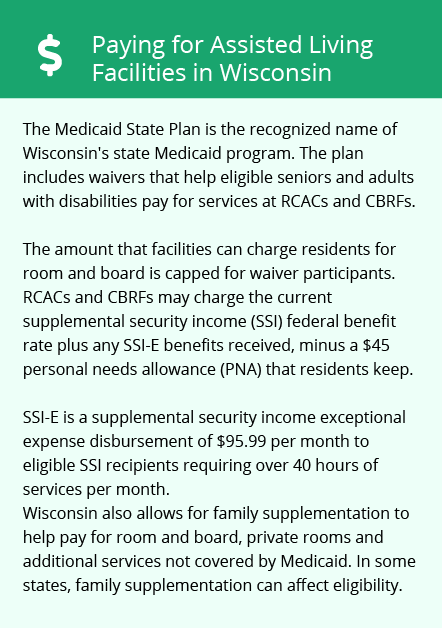 These facilities are generally located within community-based residential facilities and are licensed by the Wisconsin Department of Health Services, Bureau of Assisted Living, Division of Quality Assurance. Kenosha seniors do not pay income tax on Social Security income or public pensions, but private pensions and withdrawals from retirement savings accounts are fully taxable. The amount of money a senior can put in their memory care budget may be affected by the sources of their retirement income. Kenosha County was given an F for ozone pollution, a B for short-term particle pollution and a passing grade for annual particle pollution by the American Lung Association. This may be a consideration for seniors with respiratory illnesses or cardiovascular disease. While the cost of living in Kenosha is about 8 percent below the U.S. average and 6 percent below the state average, healthcare expenses are a little higher here than elsewhere in the state and country. Seniors who are on a budget may want to consider the cost of managing a chronic condition like dementia here. Kenosha's summers a mild and comfortable with highs in the low-80s, which may be well-suited for seniors who enjoy outside activities like walking and gardening. However, winters are cold, dry and windy with January highs near 30 degrees and lows in the teens. Families should ensure that the memory care facility they choose takes strides to prevent residents from wandering outdoors, particularly in extreme temperatures. Memory Care costs in Kenosha start around $4,553 per month on average, while the nationwide average cost of memory care is $4,800 per month. It’s important to note that memory care rates in Kenosha and the surrounding suburbs can vary widely based on factors such as location, the level of care needed, apartment size and the types of amenities offered at each community. To see a list of free memory care resources in Kenosha, please visit our Assisted Living in Wisconsin page. 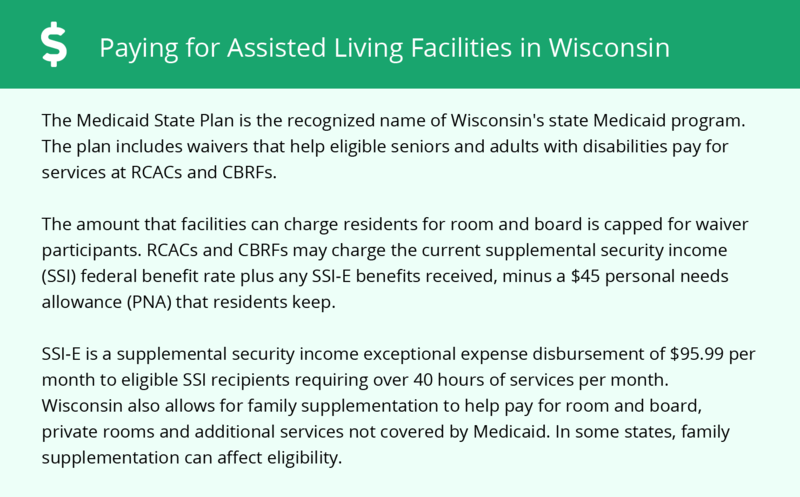 Kenosha-area assisted living communities must adhere to the comprehensive set of state laws and regulations that all assisted living communities in Wisconsin are required to follow. Visit our Memory Care in Wisconsin page for more information about these laws.